Sen. Elizabeth Warren greets potential voters during a campaign stop at McCoy’s Bar Patio and Grill on January 4 in Council Bluffs, Iowa. The Democratic Party has drafted a new strategy to defeat United States President Donald Trump in the 2020 presidential election: Shift harder to the left. 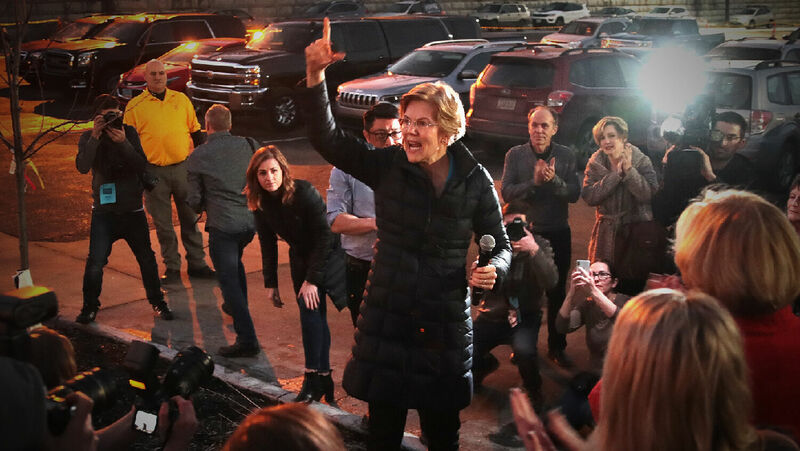 Democratic senators Elizabeth Warren, Kamala Harris and Kirsten Gillibrand have announced their candidacies for president, and several others are seriously considering runs. This lineup includes a record number of women and ethnic minorities. It is also the most left-wing presidential field in U.S. history. So far, Massachusetts Sen. Elizabeth Warren is the biggest name in play. Unlike some of her colleagues, she does not embrace the socialist label. She says she wants to fix capitalism rather than replace it. Yet the details of her economic proposals would actually constitute the largest government takeover of wealth in human history, more than any socialist seizure ever. In August, she introduced a bill in the Senate proposing that the government should manage every U.S. business with more than $1 billion in revenue. That would turn more than 1,000 American companies (90 percent of American businesses by sales) into state-run entities. The government would control over 97 percent of the entire U.S. economy. Warren’s radical proposal is just one among many. California Sen. Kamala Harris officially entered the 2020 fray on Sunday with a speech outside Oakland City Hall. Hailed as a “female Barack Obama,” Harris says she will run as a “centrist independent outside of the two-party system.” Yet her proposals regarding debt-free college and “Medicare for all” are far from centrist. Vermont Sen. Bernie Sanders, a self-described socialist, previously advocated both of these proposals. According to a George Mason University study, the “Medicare for all” program would spend about $3.3 trillion per year (93 percent of the total projected 2019 tax revenue) on health care alone. Sen. Kirsten Gillibrand called on Congress to abolish the U.S. Immigration and Customs Enforcement Agency, effectively erasing the nation’s border. She has embraced legal marijuana and endorsed a plan for government-guaranteed jobs for all Americans. Taken together, her proposals would allow illegal immigrants to pour into the country, claim a guaranteed job, and openly indulge in drugs. All of these proposals would have been unthinkable just one election cycle ago. Other Democrats have other radical proposals. More than 40 of her fellow Democrat lawmakers have endorsed Rep. Alexandria Ocasio-Cortez’s “Green New Deal,” an environmental plan to eliminate all fossil-fuel-powered electricity and replace all energy needs of the U.S. economy with renewable energy within 12 years. While Ocasio-Cortez is too young to run for the presidency, she is hoping other candidates will take up some of her policies. All of these proposals are just the latest steps in the Democratic Party moving to the left. This radical shift has been ongoing since supporters of the New Left movement hijacked the 1972 Democratic Convention. But recently, it has intensified to the point where the Democrats may start losing support as the silent majority of Americans become fearful of how radically far left Democrats’ positions have become. If the party becomes smaller and radicals remain in control, it may begin acting even less like a mainstream party and more like a revolutionary party. Decades ago, Plain Truth editor in chief Herbert W. Armstrong warned that far-left philosophy would strip America of its blessings—the greatest national blessings ever conferred on any people. He said this would happen not because socialists outmaneuvered conservatives, but because the American people as a whole have turned away from God’s law. In particular, he warned that Communist thought would pervert America’s morals, sabotage its educational system, wreck its social structure, destroy its spiritual life, and weaken its economic power. Those students of the 1960s are now educators, journalists, leaders, senators and presidential candidates. Mr. Armstrong based his forecast of future events and trends on Bible prophecy. Hosea 7:8 predicts that the modern-day descendants of ancient Israel would mix themselves with foreigners and foreign ideologies. The far-left ideas put forward by the Democratic Party today are not based on traditional American culture, which is largely based on the Bible. They are ideas that were brought to America from German and Russian universities. Today, the 1960s New Left student radicals who embraced these ideas are the leaders of the modern Democratic Party. These radical leaders are now shifting their party even further toward socialism to gain the support of the millennial generation—a demographic that leans overwhelmingly Democrat and even socialist. Their strategy can only lead to violence as socialist revolutionaries seek to destroy the current system and replace it with another.